Posted on Tuesday, April 2nd, 2019 at 1:04 pm. Set in a fun, informative atmosphere, find your perfect pairing at We Olive & Wine Bar at the Mix. Join us the first Tuesday of each month from 7:00pm – 8:30pm as we pair 5 wines, 5 olive oils, along with 5 cheeses for our signature tasting event. Book in advance as we sell out of this event. A great date night, ladies night out it’s a tasting event for your favorite foodie friends. You will be guided by our expert olive oil owner Phil Brooks, wine sommelier Wes Kollar, provided with cheese from The Cheese Shop at The Mix as they guide through this unique tasting. 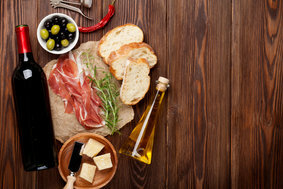 When each wine, olive oil, and cheese are tasted together, it will tantalize your taste buds! A great tasting for your wine and foodie friends. Cost is $35 per person. Limited Seating Available. RSVP Required. *EXCLUSIVE discounts on bottles of wine and olive oil are offered during the event. **Reservations are required** and space is limited to 26 people. Call us at 949-284-0609 to make your reservation. ***Payment is taken with reservation. I would like to make a reservation for March 7th – how many seats are available? As of right now we have about 12 seats left for the 7th. If you would like to reserve, please give us a call at 949-284-0609. When are your next Wine and Olive oil pairings for December? Or january? Hi Helen, We had our December tasting and sold out. We will be taking the month of January off. So our next tasting will be on February 6th from 7-8:30pm.